New Blade Torrent, new pilot, no auto level mode as advertised. So I just picked up a new Torrent to move up from my inductrix, Also had to get a new DX6 since the torrent is not compatible with the DX6i. According to the instruction manual, mode 0 is supposed to be angle mode which is auto leveling but it is not, none of the three flight modes are, they all act like what I know as acro mode in the inductrix. So I called up horizon tech support and the guy told me that he believes they removed that mode from the newer version and that I could add it in myself with betaflight. 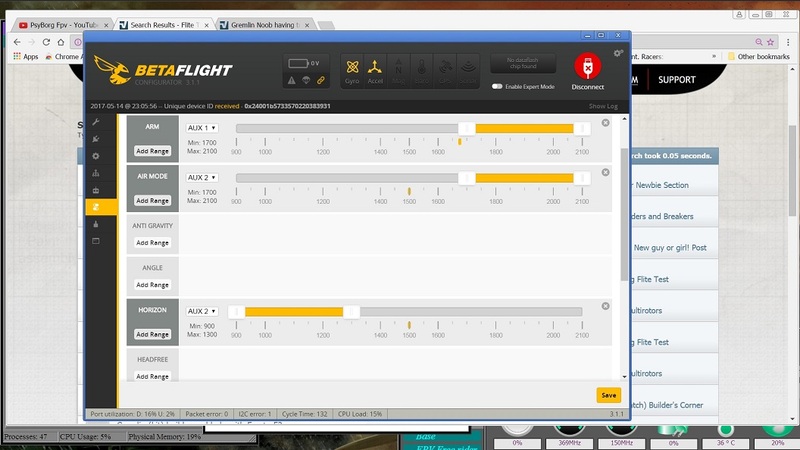 I am very new to all of this and could not for the life of me find anything online on how to set up the torrent with betaflight and get the autolevel mode back in it. I am good enough with acro mode to fly like that in big areas but I'd also like to be able to fly it indoors like my inductrix and very much need to have auto level for that, so anyone know how to set it up? Any help would be greatly appreciated. Its pretty easy to do. Figure out what switch you want to assign to be your flight mode and what aux channel as well. I usually use a 3 position switch for what I do. I set up position 0 to be horizon mode and I don't even bother with angle mode. then position 1 is acro and position 2 is acro with Air mode. The Beta flight page looks like this. Thanks, got it working. I also had to flash the board with some settings from horizon, following a couple videos I found from them. Now I just have to figure out this problem I have with the copter wanting to drift right when in auto level that trimming won't fix because it gets worse and worse the longer it flies, but landing it and dissarming/re-arming will usually fix it for a little while. I notice that at times. I think these things only know what level is by their "still" time when they are first set down and then beep. I tried putting my quad down on a more angled board for the initial "still" time and when I tried taking off it was way off. Even when the ground is level it seems the inner reference they have drifts. Usually the gyro's are reset whenever you first power on the FC, which is why when if you power up on an angle and take off you will maintain that angle. The auto leveling functions are done with the accelerometer, which is calibrated in BF/CF and has it's own trims set in BF/CF or by stick commands. The OP's problem is probably more of a tuning issue though, the I term could probably be increased a bit to see if it helps. Using transmitter trims is not recommended ever in the multirotor world. I've thought about trimming it in BF too, but I'm not even sure that would help as it drifts more and more the longer it flies. Eventually it gets to the point where I am almost full stick left or forward just to maintain hover but landing and disarming then re-arming will fix it for a while. Have also tried powering it on while sitting level. Probably more of a tuning issue, try increasing the roll I gain a couple of points. Been seeing in other forums that this drift thing is a fairly common issue with the torrent in angle mode. Often happening due to vibrations, and occasionally due to the FC. May be why HH removed angle mode from them from factory. Might try changing out props and see if that helps since a couple of them have gotten bent and I just bent them back into place, may not be perfect and causing vibrations. Well.. first stop using angle mode it is very basic and not much can be done to help it like with Horizon mode. Next there are many factors that effect how the auto level functions work at keeping things level. First and foremost is the accelerometer calibration you can do in Beta flight or any gui for that matter. That is really not that important to be perfect. Put it flat on a table and make sure the FC is as close to level as you can get by eye don't go by the frame as more then likely you attached it to the frame with double sided tape and it will not be close to the frame plate anyways. Next when you pick up the frame hold it as best as you can centered between the props and FEEL what the balance is like without the battery. Camera placement as well as VTX and receiver placement plays a huge part in how level these tiny things will hover. Make note if it feels heavier front to back with this. After you strap your battery in do that test again to see if it feels balanced. I rock mine back and forth between my fingers to see how it wants to swing and how it comes to settle at rest. Then you can slide the battery a bit forward or back to counter that. Usually that is enough to keep it reasonably stable in auto level modes. If it drifts side to side then you can usually force the battery to the opposite side to counter that as well. If you notice a consistent drift in one way you can always move the receiver or the VTX a bit to compensate. If the copter still drifts then upping the I term as was recommended will help that too. I do not however recommend using offsets in software as it all gets dumped when you re calibrate the accellerometers.